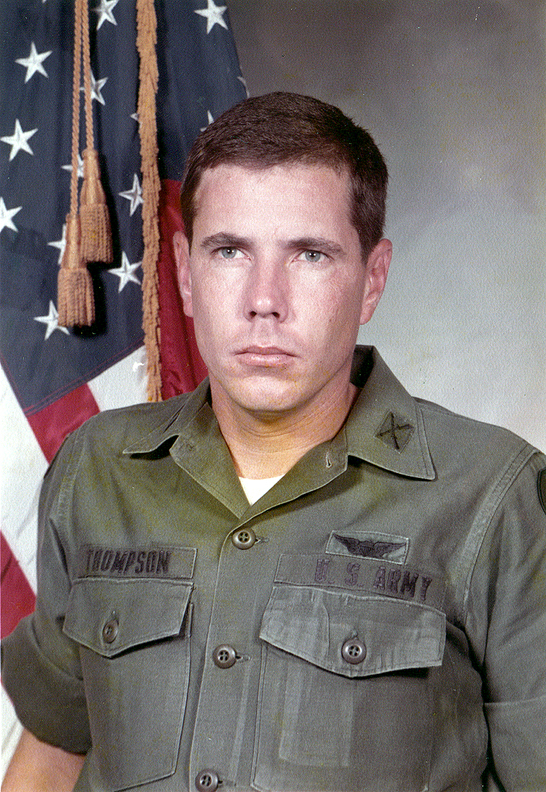 Hugh C. Thompson, Jr. (April 15, 1943 – January 6, 2006) was a helicopter pilot during the Vietnam War. He is chiefly known for his role in stopping the My Lai Massacre, during which he was flying a reconnaissance mission. Born in Atlanta, Georgia, Thompson joined the US Navy in 1961 — then US Army in 1966 and trained as a helicopter pilot. 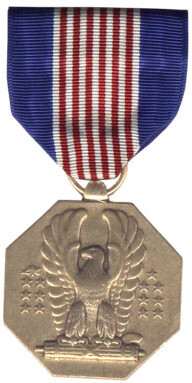 He volunteered for the Aerial Scout Unit and assigned to Task Force Barker to fly over Vietnamese forests and try to draw enemy fire, to pinpoint the location of troops. Serving as one door-gunner, his Crew Chief was Sp4 Glenn Andreotta and his other door-gunner was Sp4 Lawrence Colburn, both of whom would later receive recognition for heroism for their role at My Lai, though Andreotta died three weeks after the event. The story I am about to share with you took place in Vietnam over 43 years ago. 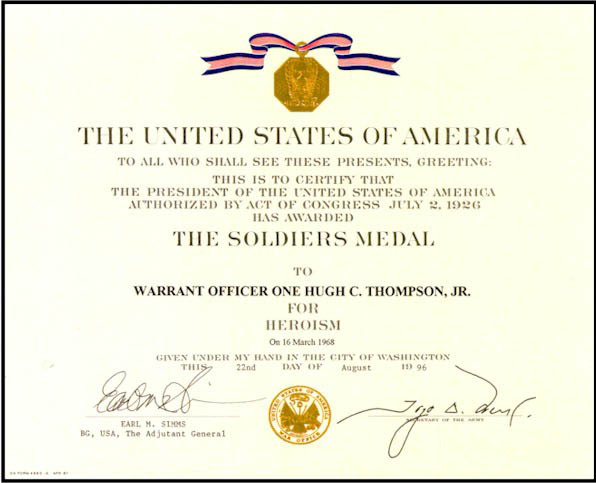 I would venture to say that most Americans have never heard of Hugh Thompson but on March 16 1968 he put his life and his reputation on the line in order to save some innocent civilians from the ravages of war. The whole event has been shoved into the dustbin of history. It’s like it never happened. Our government and military have a memory that is “hard wired” to remove any nasty events like the massacre at My Lai. May I humbly beseech our country, our government and every American citizen to never forget but rather “learn” from the events that unfolded 43 years ago at the tiny village of My Lai. Thompson decided to move out of the area and check another nearby village. Once again no enemy was encountered. They swung their helicopter around and headed back to the village of My Lai. They dropped below the tree line and were skimming across the jungle floor. They could clearly see the villagers but this time nobody was moving. They were all dead. Women, children, infants and old men and women were piled up like cord-wood in a long irrigation ditch. To the horror of Thompson and his two man crew, they were witnessing an American army platoon, lead by Lt. Calley, in the process of systematically murdering 400 to 500 innocent Vietnamese villagers. Hugh Thompson landed his helicopter. He placed his two men between the soldiers and the ditch. He instructed his two crew members to open fire on their American comrades if they attempted to kill one more villager. Hugh Thompson went about convincing ten terrified villagers to come out of a small earthen bunker that they were hiding in. He also discovered an 8 year old boy in the ditch. He was alive and was clinging to his dead mother. Thompson called for additional helicopter support and they transported these few remaining villagers to a hospital and saved their lives. Hugh Thompson personally brought the young 8 year old boy to the Quang Nhai Hospital which was run by catholic nuns. The mother superior met Thompson and only at that time did he release the young boy to the care of the nun. The unspeakable actions of these American soldiers are not to be condoned however they are, in my opinion, symptoms of a deeper problem that exists in our country. Could the real problem be that our government has developed a bias for violence and war? This bias for violence has been systemically institutionalized into the thinking of many American citizens. Our government’s “Might Makes Right” mantra is constantly communicated in the newspapers, TV and in the war games that we allow our children to play. Yes, our government is creating more Lt. Calleys and more My Lai massacres. So why are we surprised when young soldiers do things similar to what was experienced in the tiny town of My Lai? It’s because they have been exposed to violence throughout their entire life. Our country inexplicably draws itself to violence and war, much like a moth draws itself to a lit candle. Symptoms of this show up in some startling statistics. The United States currently has 760 military installations throughout the world and argues that it is not empire building. We have a military budget of more than 700 billion dollars per year. This is more than the combined spending of all industrialized nations throughout the world. At this very moment the entire world is embarking on a period of major transition. The recent earthquake in Japan and the ensuing Tsunami should jolt us into the reality that all people and all nations exist, at best, on a very fragile planet and that we need to view all people and all nations as family and work together rather than against each other. Let the United States take the recent events as a wake-up call and as a nation, abolish war as an instrument of national policy.